Lately we have been practicing more skip counting with the kids using Little Math and reinforcing the lessons with our abacus. We also use some youtube videos, as well. There are a few learning playlists available on my channel, including skip counting, at www.youtube.com/teachingmytoddlers. 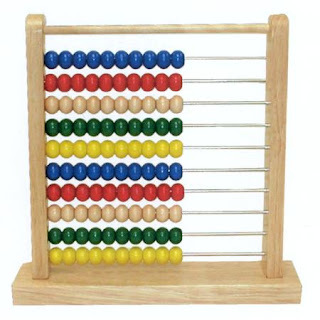 While you can count with any manipulatives or household items, what I like about the abacus was that there is no mess to clean up afterwards. However, the abacus just didn't seem to be as effective as it could be. I decided a long time ago I should paint it, but I finally buckled down and took a few hours out of my morning to actually do it. I used one of the kids' paintbrushes and it's definitely a mediocre, amateur paint job. I suppose I could have just replaced the beads with colored beads from a craft store, but I used what I had on hand didn't cost me a cent out of pocket. I originally started to paint it with the beads on, I was feeling lazy and didn't want to go through the hassle of trying to take the thing apart. However, right away I could tell that it was going to be a pain and was better off taking it apart. Turns out, it only required a screwdriver and about a minute to easily disassemble it. 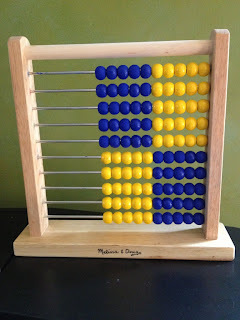 Plus, this allowed me to separate the beads to paint the lighter colored beads yellow and the darker colored beads blue. I slid them on bamboo barbeque skewers to dry and spray with a clear coat. I could have used any color paint I suppose, but I chose RS colors in case I decided to use their iphone/ipad app or official workbooks in the future things would match. Using the supplies you have around the house will save you money if that's important to you, but using spray paint versus a brush will speed up the process a lot and save the frustration of multiple coats to cover the red, for example. I happened to find some spray primer in the shed AFTER the fact and it would have really helped to get the paint to stick easier, I wish I had found it sooner. 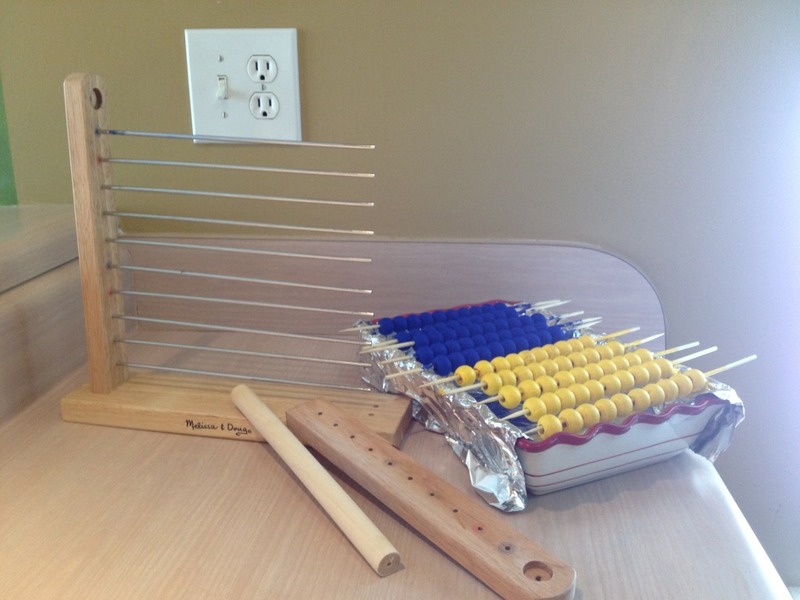 So, go be inspired and take apart your abacus that is just collecting dust and slap some paint on it! You'll be glad you did. (I have no idea why this is posting sideways)I painted the beads to match the www.MathSecret.com bead colors. You can download their e-book and practice on the webbased program for 10 minutes daily at no cost. Simply create an account and then add multiple students in it so each child's progress is tracked separately for the timed tests on each level. 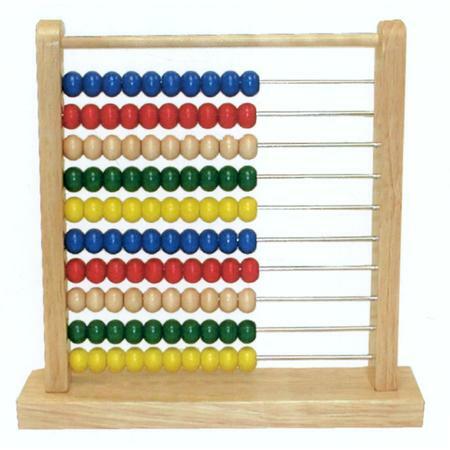 However, do NOT get their "free, you only pay shipping, too good to be true" abacus. It's JUNK. Check it out! 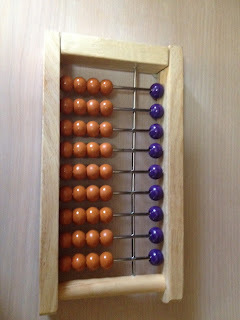 Hi there, I was wondering if you know anyone who can teach how to use the abacus to my daughter (13 yo) and me. An hour on skype would be great. We are looking for a tutor. Of course, we would pay for the tutor's time. Thanks! Great post, I really liked your post, please keep sharing these kinds of informative posts with us.